PRL National Science Day 2019 – Results of the Screening Test held on 20th January 2019. 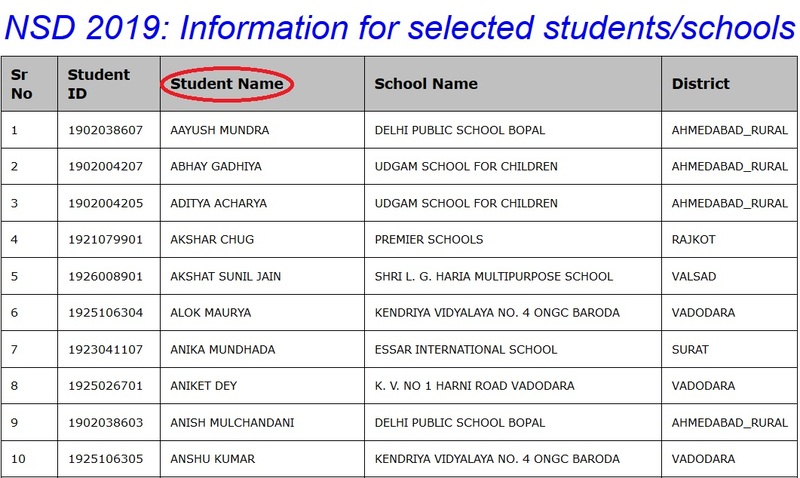 List of students in alphabetical order selected to participate in the further round of competitive events to be held at the Physical Research Laboratory, Ahmedabad on Saturday, 2nd March 2019. Some of the selected Students/Schools Lists are listed below. Kindly refer the above link to view the complete selected students list. The principal should log in using their username and password to confirm the participation of the selected student(s). ** Select a theme for a poster/model. ** Please note that the information related to participation and registration should be submitted online together for the student(s) selected and the details submitted once will be final and cannot be changed later. ** Also, provide the name of the accompanying person i.e. teacher/ guardian (mandatory). ** Please note that the information related to participation and registration submitted online will be final, and cannot be changed later. ** The last date for the registration for participation is 21 February 2019, 17.00 hrs. In addition to the Scholarships, various prizes will also be awarded to toppers of the screening test, and posters/models competition. ** Selected student(s) should prepare a poster in English, Hindi or Gujarati or combination of these languages. ** The poster should be on a thick white paper or chart paper (maximum size 100cm height x 75cm width). ** Normal pencils, colour pencils, colour pens, crayons and sketch pens can be used to make the posters and highlighting the matter. Fancy materials such as marker pens, water/oil colours, glitter pens etc. should not be used. ** Printed, web-downloaded or photocopied text or figures are NOT permitted. ** Marks will be deducted for not complying with the above guidelines. Posters will be evaluated by a panel of judges on the basis of (a) content related with the theme, (b) creativity, (c) understanding of the subject and (d) style of the presentation. ** A concept, principle or a process. ** An indigenous design of a machine/device. ** An innovation/inexpensive design or a technique. ** Application of basic principles of science/ technology. ** Scheme/design of a device or machine to reduce production cost. ** Display board and electrical supply points will be provided if it is requested while confirming the participation. Any other material i.e. Laptop/drawing pins etc. should be arranged by the student. The size of the table provided to keep the model will be 4 feet x 2 feet (maximum). ** Any expenses for the preparation of the model will not be borne by PRL. ** Use of LPG/CNG or any other flammable material will not be permitted. Water connection will not be provided for any model. ** Any readymade/commercially available model will not be considered for the competition. The decision made by the judges will be final. ** Participation in the programme is limited to the selected students and one accompanying person (teacher OR guardian) per school. ** Entry into PRL from gate no. 3 (opposite to Knowledge Consortium of Gujarat (KCG) gate will begin at 08:00 hrs on 02 March 2019. ** The student(S) must carry the admit slip attested by the school principal. Both, student and the accompanying person, MUST carry a Photo ID for entry into PRL. In view of the safety and security measures, entry into PRL without proper photo ID will not be permitted. ** Only students from outside Ahmedabad (non-local) will be reimbursed second class rail or bus fare by the shortest route on the production of tickets to PRL authorities. Breakfast, tea and lunch will be provided to all the students and accompanying persons attending the NSD celebrations.